Renhold United are now five points clear at the head of the Premier Division supported by Sportsform after they maintained their 100% away record in winning 3-0 at AFC Oakley M&DH on Saturday. This ended the hosts’ unbeaten home record and also perhaps their hopes of retaining their league crown. Mark Reed did the damage with a brace plus a strike from Aran Hazelwood doing the damage. For second place Shefford Town & Campton it was defeat number five on the bounce when beaten 3-1 at Pavenham, James Owen netting twice and James Lowe once against a lone Town reply from Jake Renney. Whilst third place Flitwick Town also lost ground on the league leaders when held to a 2-2 home draw by AFC Kempston Town & Bedford College, Daniel Stafford netting both home goals against replies via Aaron Chaplin and Andrew Latimer. The biggest winners of the day were Wootton Blue Cross who took their winning ways up to five games and their unbeaten ways up to seven games in winning 6-1 at Caldecote. Carl Ibbotson led the way with a hat-trick being supported by single goals from Neil Mangan, Ryan Mellor and Ian Buckingham against a lone home reply from Conor Smith. Also enjoying life on the road were Wilstead in winning 2-0 at Ickwell & Old Warden to end the hosts’ four game winning run. The opening goal arrived just seven minutes from the break via an own goal according to most of the watching eyes but off Luke Prietzel’s knee in the view of the visiting management team and the points were sealed when Callum Evans doubled the scoreline three minutes from time by which time the hosts were down to 10 men following a red card for Dean Hamilton some 10 minutes earlier. Joining the list of away winners on the day were Eastcotts AFC who won 2-0 at Marston Shelton Rovers thanks to strikes from Michael Sexton and James Fairburn. 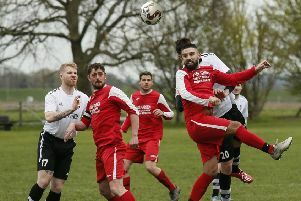 Elstow Abbey remain nine points clear at the head of the Division One supported by Wests Citroen Bedford league table after they took their unbeaten ways up to 11 games with a 5-1 home victory over Bedford SA. Danny Pilgrim fired them ahead in the 14th minute before Jason Simons doubled the scoreline in the 32nd minute to see them 2-0 ahead at the break. Within six minutes of the restart Callum Davenport had headed home goal number three and when Tom Pitts increased the scoreline up to 4-0 ten minutes later the points were safely in the bag. However, the visitors via Richard Lightfoot were to claw a goal back in the 70th minute before Andy Klein netted the nap hand goal nine minutes from time. Now in second place are Cranfield United who in having played four games fewer than the Abbey kept the pressure on them with a 6-0 win at AFC Harlington to extend their winning ways to eight games. Jordan Appleton netted twice alongside strikes from Martin Holland, Adam Hulks and a Liam Whitmee-Craig penalty who then went on to miss later in the game from the same penalty spot. Dropping down into third are Henlow following their 2-1 defeat at Marabese Ceramics who were winning on home soil for the first time this season. Joe Follano and John Chitondu on the home scoresheet against a lone reply from George Renney. Whilst for fourth place Great Barford it was an extension of their unbeaten ways up to 11 games with a 4-1 victory at Riseley Sports.Nick Payne, Michael Pickard, David Mulvhill plus an own goal marked their scoresheet against a lone reply via James Cooke. Elsewhere, AFC Kempston Town & Bedford College Reserves took their home winning ways up to four games by beating Meltis Albion 2-1. Keegan Roberts and Chris Allen netting the vital goals against a lone Albion reply from Alexis Kamenan. Whilst Sundon Park Rangers were also 2-1 home winners over Potton Town thanks to strikes from Ryan Smith and Shaka Anderson against a Town penalty in reply from James Pyman. The scheduled Shefford Town & Campton Reserves v AFC Oakley M&DH Reserves game was called off. Clapham Sports remain at the summit of the division two league table following their 10-2 home win over Caldecote Reserves who were losing their ninth away game on the bounce. Pablo Grasso bagged a hat-trick and was supported by braces from Liam Bolton and Grant Williams plus single strikes from Sam Maddix, Neil Larham and Ryan Prior against replies from Nicky Albone and Sam Julian. Second place Stevington have now won their last 12 games after winning 4-1 at Renhold United Reserves. James Bourke netting twice alongside Jordan Wright and Aaran Hewitt to do the damage against a lone home reply from Lewis Debbenedittis. Elsewhere, like the league leaders now third place Westoning also enjoyed a double figure win when they retained their seasons unbeaten away ways and took their winning ways up to nine games in triumphing 10-2 at Kempston Athletic. Brin Reynolds with a hat-trick being supported by braces from Rex Ludlow and Sean Cooksley plus single strikes from Thomas Cooksley, Glen Cooksley and Michael Armitt against home replies via Richie Andrews and Sean Lawrence. The third place was vacated by FC Houghton who saw their 13 game winning run ended when held to a 0-0 home draw by Kempston Hammers. Remaining in fifth are Elstow Abbey Reserves who won 6-4 at Bedford United. Matt Poulton and Myles Ferraro both netting twice alongside single goals for Dean Leydon and Jordan Stanley against United braces in reply from Jamaal Dixon and Tom Wade. Whilst making up the top six are Wootton Village who won 10-0 at Meltis Albion Reserves who have now lost their last nine outings. Tinashe Chibanda led the way with a hat-trick, Adam Flynn and Nick Burraway grabbing braces to go alongside single strikes from Errol Cornwell, Aiden Medhurst and Jay Rogers. The scheduled Wilstead Reserves v Moggerhanger United game was postponed due to the state of the pitch at Jubilee Playing Fields. There is no change at the head of the Division Three league table despite defeats for the top two sides. Leaders Flitwick Town Reserves lost for the first time in 10 outings when beaten 2-0 at Cranfield United Reserves who duly retained their unbeaten home record and now sit just two points behind the Town in the league standings having played three games fewer. Ben Thompson and Phil Kempsell netted the vital goals. Whilst for second place Lea Sports PSG it was a 2-1 home defeat at the hands of FC Serbia who are now unbeaten in their last seven outings and up to fifth place in the league table. Zdenko Kuhar and Milan Marusic on the winners scoresheet against a lone home reply from Ryan Darby. Following three straight home defeats it was home sweet home again for fourth place Atletico Europa who ran out 4-2 winners over bottom of the table Mid Beds Tigers who have now lost their last five away games. Mo Banda scored twice alongside Ric Bulzis and Aslan Odev for the home side against Tigers replies via a Steve Monks penalty and a strike from Daniel Whitten. Slipping ever further out of the promotion race are sixth place Clifton who lost for the sixth straight time on the road when beaten 3-0 at White Eagles who were ending a three game losing run, Jacek Tereszkicwicz, Artur Lukowski and Damain Krawezyk all on the Eagles scoresheet. Having lost their last six home games Caldecote U20 stopped the rot by sharing the points in a 1-1 draw with Sandy Reserves for whom Aaron Seldon struck to give the visitors a share of the spoils. Elsewhere, Shefford Town & Campton A were gifted the three points when Westoning U20 failed to raise a side to meet them at Rectory Road.